Like all areas of the home, decks require regular maintenance to stay beautiful and strong. Keep your deck looking like new with routine deck refinishing services. Gantner Painting Co. is a commercial and residential painting business based in New Britain, CT, with a variety of services that include deck refinishing. With the proper tools and an experienced staff, they’ll be able to transform your existing deck into a fresh outdoor space for your whole family. Enhanced Appearance: Over time, your deck’s finish will wear away and the surface will become rough and dirty. If it’s not properly maintained, it can deteriorate to the point of splinters, warped boards, and popped nails. A professional deck refinishing business such as Gantner Painting Co. will bring back your deck’s previous beauty. With some power washing, sanding, and staining, they’ll have your tired deck looking fresh and new. Prevent Mold: Properly applied sealants can help prevent the growth and habitation of mold, but they need to be regularly reapplied every couple of years. 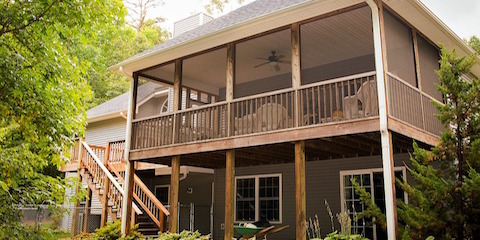 When the sealants crack and break down—as they eventually will—moisture can sneak its way into the deck’s wood. This leads to the cultivation of mold spores, which can not only negatively affect the appearance of your deck but can also prompt health hazards. Provide UV Protection: Daily exposure to the sun’s rays can damage any wooded structure. That’s why sealants and stains are essential for preserving and prolonging the life of your deck. Eventually, the rays will wear away your deck’s protective coatings, and it will be necessary to have your deck refinished again. Aim to have your deck refinished every year or two for optimal protection. Gantner Painting Co. is available to refinish decks of any size, type, and age, so you can get back to enjoying time outside. Makeover your deck today. Gantner Painting Co. provides the deck refinishing services property owners need to keep their outdoor spaces in top shape. Call (860) 225-8577 for an estimate, and for more information, visit their website.